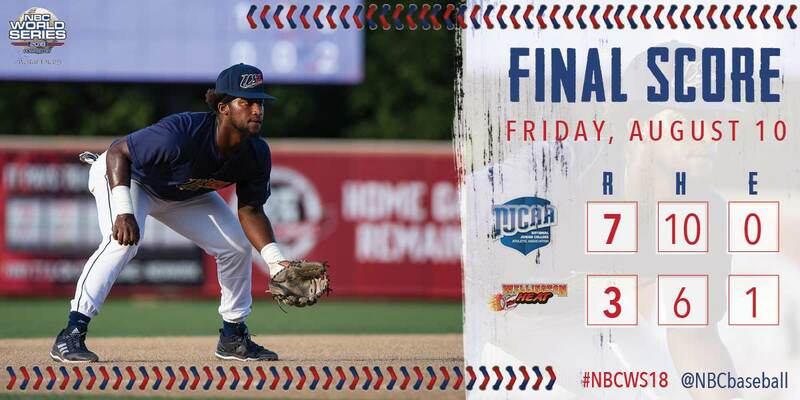 The Wellington Heat lost in the semi-finals to the Juco National Team (Team USA). 7-3. The Heat took an early 3-0 lead in the game, but did not keep it for long. USA, scored in consecutive innings to take the lead late in the game, and did not look back. Although this loss was heartbreaking for Heat and KCLB fans, we could not be more proud of the way the Heat represented the KCLB in the world series. They posted a 4-1 record, and beat the Jayhawk League Champion Hays Larks, and Pacific International League Champion Seattle Cheney Studs. Quality wins over top programs in the country. The Heat finished 45-10 overall. The KCLB finished 7-2 in the NBC World Series. The highest winning percentage of all Kansas based leagues. Heat 4-1, Cannons 3-1.